Magnetic nail polish is a novelty in my book -- read tons of reviews, but never executed the effect on myself until tonight. Let's just say the experience conjured up memories from the movie Gremlins, you know, "never feed him after midnight!" The polish perked up in some areas of the nail as it gravitated towards the magnet; however, the "effect" was patchy at best. Some nails responded well and the rest fell flat. Essie's lil' boa peep leaves a lot of room for improvement. The formula was thick, yet glided on smoothly; it also dried quickly, but failed to perform its magic. I even applied clear nail polish atop two coats of lil' boa peep in order to reactivate the magnetic polish, but most nails really weren't having it. For those who are wondering how the magnet comes into play.. the bulky cover as seen above pops off and reveals the usual Essie cap/applicator. The superficial cover holds the magnet and is meant to hover ever so closely above a freshly painted nail. The experience is scientific at best! Oh and the Gremlins reference, that had to do with my left index nail; whenever I look at it I think of that moment when the multiplied demonic, furry creatures mutate into torcherous, ankle biting hellions. That sums up the effect on my nail -- blech! In other news: I've missed you! Yes, lots and lots of shopping has taken place, but it doesn't make up for the fact that we haven't hung out in a while. So, what's new in your world? 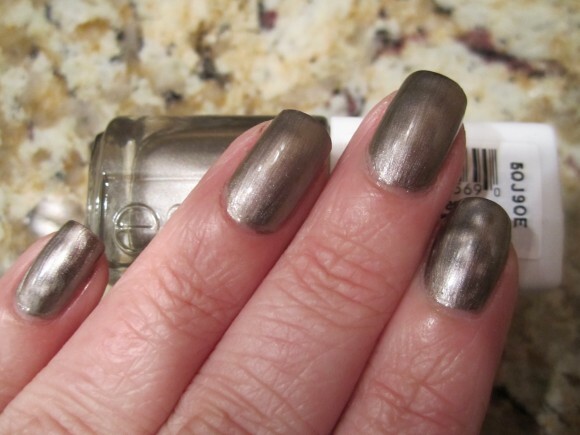 And, what do you think of this polish? I figure if I can't get it to work, at least I have a pretty metallic copper shade on my hands. Right?! If you're interested in a totally newish Essie adventure, get on over to your local CVS and grab one or all six shades. The Repstyle collection retails for approximately $11.99 USD per bottle.